A fascinating semi-final awaits on Thursday in the third all-top ten clash of Wimbledon 2016 between the number four seed, Angelique Kerber and the number eight seed, Venus Williams. With a head-to-head that has produced multiple compelling contests, this has all the ingredients to be an awesome match. Kerber was first into the Wimbledon semi-finals, edging Simona Halep in two tight sets, 7-5 7-6(2). It was Kerber’s first win over Halep on the WTA tour and it was probably the match of the day with some wonderful rallies. While the match featured 13 breaks of serve in 24 games, this was a classic example of where holding serve does not define the quality of the match. There were eight consecutive breaks of serve in the first set as Halep finally earnt her first hold of serve serving at *4-5. Halep produced some fine angles, but Kerber was a touch more aggressive and also produced a couple of effective drop shots, which seemed to come at crucial moments. Kerber had a fine love hold to 6-5 in the first set and Halep couldn’t force the tiebreak, double faulting down set point. Into the second set and Halep had a gutsy hold to 2-2 with Kerber missing a sitter up at the net. It felt like a pivotal game that could turn the match in Halep’s favour; however it was quite the contrary as Kerber produced her best quality tennis of the match, winning eight straight points to go up 4-2. Once again pockets of variety, such as the backhand slice, caused problems for Halep. The Romanian player never stopped fighting although Kerber stayed ahead in the score. The German player served for the match at 7-5 *5-4 – Halep broke back to 15. Serving to stay in the match at *5-6, Halep played arguably her best game of the match with a couple of flashy winners and solid serving. She forced the tiebreak and seemed to have the momentum. Kerber though, won five points on the trot including a pair of missed returns from Halep. Kerber also came up with some super depth during the entire contest and at times, the German player almost looked surprised that some of her shots were landing on the lines! Kerber got lucky up 5-2 in the tiebreak as a net cord bamboozled Halep who was up at the net. Kerber converted on her first match point to reach her second Wimbledon semi-final. All in all, this was a pretty decent tournament for Halep having had no matches on grass prior to this year’s Wimbledon. Not only was it a surprise to see Yaroslava Shvedova in the Wimbledon quarter-finals but also, Yaroslava had never played Venus on tour before. The first set was pretty wild as both tried to figure each other out. It was a well contested match and it began with four of the first five games going to deuce. Shvedova started the stronger, earning the first break but she couldn’t consolidate with Venus breaking straight back. Venus had a set point up 5-4* but Shvedova produced some classy tennis to prolong the set – a serve-FH combo saved the set point and a cross-court backhand winner helped her to 5-5. The first set meandered into the tiebreak where Shvedova was up 5-2. 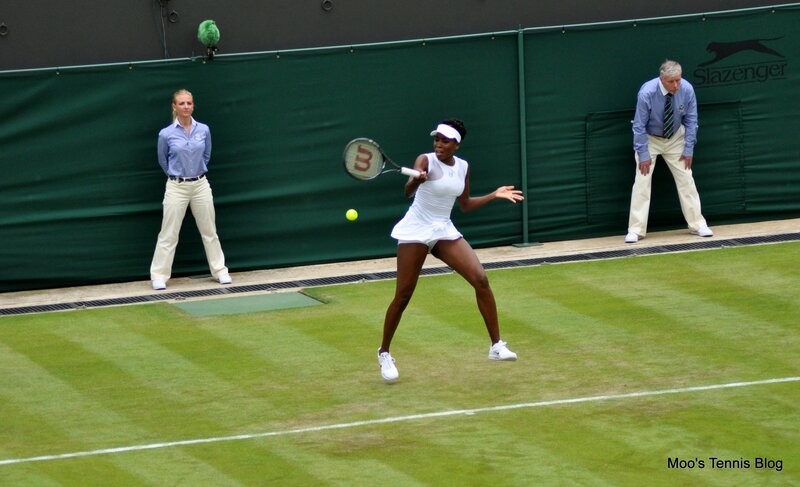 Venus’s fighting instincts and Shvedova’s nerves both came to the fore. Venus reeled off the next five points, with some help from Shvedova, to bag the opening set. The pair exchanged breaks at the start of the second set but Venus took control from there on. Shvedova saved the first match point, smiling away and trying to get the crowd going. Despite the scoreline she seemed to really enjoy the experience, which was lovely to see! Venus won, 7-6(5) 6-2. It was a very measured display from the American player who hit just 15 winners to 12 unforced errors. Shvedova showed some lovely touches at the net, but her unforced error count of 33 was a factor in the outcome. Kerber failed to make the second week of a Slam in 2015. Goal for 2016 was to peak for Slams. AO Champ, now #Wimbledon SFist. Head-to-head record: Angie leads Venus, 3-2 in their head-to-head. Their last two matches were both memorable with Venus winning a superb encounter in Montreal back in 2014, which ranked in my top 10 best matches of the year. In their only ever grass court encounter, Angie won, 7-6(5) 7-6(5) at the 2012 Olympics. Interesting stat (s): Angie and Venus have both won three of their last four matches against top ten players. For Venus, she is in her first Slam semi-final since the 2010 US Open, while Kerber is into her fourth Slam semi-final and second of the year. Final thoughts: Kerber’s yet to drop a set at Wimbledon this year and although she looked a little passive at the start of the tournament, her last two performances against Doi and Halep were both improvements. She seems to be growing in confidence and speaking a good game in press. Venus reaching the semi-finals is a magnificent effort. She was barely moving at the start of her fourth rounder against Suárez Navarro, but has shown tons of mental toughness, roaring back in that particular match and winning tight three setters against Sakkari and Kasatkina in the second and third rounds respectively. Venus’s best, particularly on her favourite surface of grass, beats Angie’s best… but you just never know how Venus will be physically, now at the age of 36 and battling Sjogrens Syndrome. Her fighting spirit is a given but against such a dogged competitor in Kerber, who is playing consistent tennis with an aggressive twist, this will be tough. Venus also has the added challenge of playing doubles this week. On the fence a tad but my instinct says Kerber in three. This could be an absolute classic….I’m hoping it follows the path of Radwanska-Cibulkova in living up to its billing. July 5, 2016 in Kerber, Venus, Wimbledon, WTA. My heart says Venus but my head says Kerber,who I feel is peaking at the right time,she played a solid match against Halep.Venus is still in the doubles,she is one of the all time great grass court players,Kerber cannot afford to go toe to toe with Venus from the baseline,she has to mix it up. I really like Kerber, and this is difficult, but given what this will mean if Serena picks the crown, I want Venus to be with her in the final. Silly sentimental reason, but she may also stand a better chance against Venus when things get sticky. Either Venus softens 🙂 up Kerber with her power for the final or Kerber runs Venus ruggard. Venus is 8-0 in Wimbledon semifinals which is a nice stat to mention since it’s the stage she will be playing at. You can tell she wants it with the look she gives after every win. With a day off from singles I think she’ll find the energy and form to get through this match.. Regardless her efforts to reach the semifinals at 36 are amazing.. And for everyone that says she’s tired she’s still standing in both competitions . Form coming in doesn’t always win the match.. That’s why you show up to play. Thanks for inspiration Venus!! Its also worth pointing out that Kerber got her wins against Venus in periods of her really struggling with her health and career, not completely relevant to how shes playing in this tournament. (Daria)x(Daria) lost in doubles today, fun run. Speaking of doubles. Pliskova and Goerges have had some great successes this year, haven’t they? They’re almost in the top ten at this point! I wouldn’t be at all surprised if they were the shock winners here! And why the heck didn’t Gasparyan and Kuznetsova team back up? Seemed like they could have made a great pairing after their run in Paris! Thank you James!! Luckily, I was able to somehow follow livescores. I’m very happy for Kerber and – honestly – never thought she could make it that far. Winning the AO was probably the best experience I had as a fan as well as live-watching her 2nd Stuttgart title. I think she has really made the most out of her potential (and not everyone is able to say that on the WTA tour!). For the semis I’m quite torn – this is a fascinating match-up and they always have good battles. As the round before, I’d be happy for both of them to win. Angie for obvious reasons and Venus because she is indeed an inspiration and very humble and it woulld be nice to see the two most famous sport sisters competing once again in a big final! However, I have a slight feeling that all the matches might catch up with Venus. She has played a lenghty three setter and had a tougher route to the semis whereas Kerber sounded so positive in her interview – she said she is “definitely feeling it”. Soooo, I’d say Kerber for the win. I am leaning towards Venus but wont be surprised in the least if Kerber wins! I’m going for Venus. I don’t think Kerber is playing well . All Venus has to do is blast her of the court and keep the ball in the court. Venus sometimes over hit the ball. And I hope she doesn’t play in Kerber’s hands by running all around the court. Kerber only has one title under her belt, in addition to winning the Australian Open this year. Her results have been very much up and down after winning her first Grand Slam title. She already lost to Bencic, Zheng, Allertova, Azarenka, Strycova, Bouchard, Bertens, and Suarez Navarro. My gut feeling is that Venus will avenge Serena’s loss in this match. Venus for the win. Sorry I don’t like Kerber.